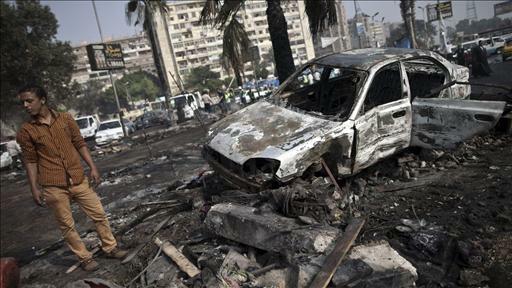 More violent demonstrations erupted throughout Egypt today, Friday August 16, 2013. Muslim Brotherhood supporters clashed against fellow Muslims, Egyptian security forces and Christians in what was designated a “Day of Rage.” Does any of this sound familiar? Wasn’t there a “Day of Rage” during the OWS demonstrations and who promoted those? 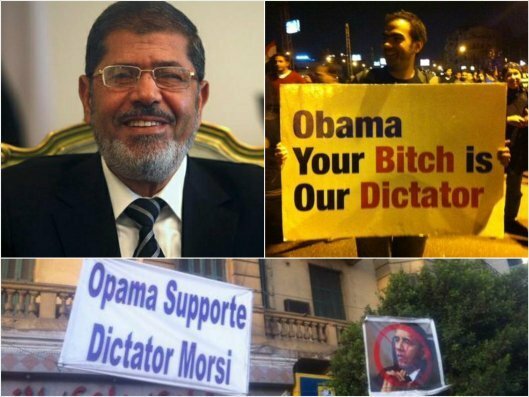 Obama has embraced, endorsed and ensconced the Muslim Brotherhood in Egypt and within OUR OWN government—they are the “modern”–yet 7th century, equivalent of the Nazis … our precious, progressive POTUS has said nothing, until yesterday, about the MB’s wholesale persecution and killing of Coptic Christians. That is because he saw his MB brothers finally getting what they deserve from the Egyptian military, who are preforming a favor for the whole of the world by cleaning their house of these savages. And, while this is going on the media, as usual, is getting the story exactly backwards while they try to save face for Obama. They are condemning the violence which they contend is against peaceful Morsi supporters—except that these supporters aren’t peaceful; they are armed and firing on the Egyptian military. I just heard a FOX News Radio reporter say that the “appearance of the photographs” may go against the anti-Morsi elements of the Egyptian population. Really? These people were betrayed by Morsi, whom Obama supported outright—they don’t care what anyone else thinks about what reporters photograph. They want to rid themselves of the Muslim Brotherhood. I think they are within their rights to do so. Meanwhile the Obama administration is condemning the Egyptian military, who is the only source of authority left and has the apparent support of the people. They don’t care what Obama, McCain or Lindsey Graham have to say about what the Egyptian people “need to do”—they’re doing it. 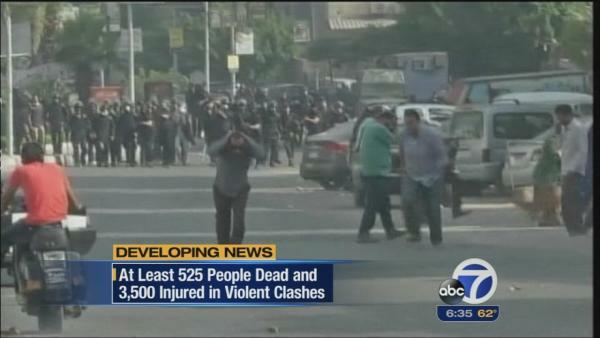 The POTUS has sponsored this Muslim Brotherhood savagery—he has the blood of Egypt on his hands! The Muslim Brotherhood is not even remotely comparable to the founding of the United States of America! The Founders were men who had experienced the boot heel of tyranny and decided to construct a government that promoted freewill and liberty—both economically and spiritually. The MB promotes Islam which is wholly theocratic in that the religion is the law and any other choice is criminal—apostasy. Islam is intolerant of all other religions and proclaims itself to be superior to all other religions. I don’t care if you want to call me a racist or not, Obama is WRONG! In fact, he could not be more wrong. Comparing the MB to our founding of America is like comparing procreation to abortion. Yea, I said it! Why shouldn’t I say it? The MB has been persecuting and killing Coptic Christians in droves throughout Obama;s tenure as President and he has NEVER uttered a word of condemnation. It is disgusting, heartless and cruel. All of this is a result of Obama’s incompetence. The Obama administration is in deep … and finally a random act of journalism by CNN has made notice of it. Though I could not have imagined what motivations Obama might have had for taking sides in Syria, he apparently had them and I believe it was to aid radical Islam in toppling Syrian president Assad. Then with the current Syrian government out of the way, assisting the Muslim Brotherhood in assuming power as he did in Egypt and Libya. The only problem was that the MB was not as organized and influential as they believed they were. They made Egypt’s already anemic economy worse and then destroyed the only industry Egypt has, tourism. Though the Egyptian people gave Morsi a chance, he was not what they thought they wanted. The MB failed miserably. The other lesson to be learned from this is that Sharia, a MB centerpiece, is not compatible with a secular society whose mainstay would be tourism. Who is going to visit a country where you might be beheaded for the slightest of offenses? Who wants to go to a country known for its beautiful beaches and be forced to be covered from head to toe? Who wants to go on vacation where some radical religious fanatics are going to be lording over your every action? Not me. Additionally, there are some members within the radial ranks of the MB who are in favor of destroying the Great Pyramids! Is there no shame? Obama is a liar and he is involved in this far beyond his legal authority. The evidence … is slowly seeing the light of day. Boehner going the right way for a booting? Despite allegations the CIA may be covering up a guns-to-terrorists scandal and the White House may have abandoned Americans to die in order to protect the secret, Boehner has entrusted already busy, existing House committees to look into it. Boehner’s reluctance to launch a more serious investigation has prompted a challenge from within his own party, as Rep. Frank Wolf, R-Va., introduced a resolution to establish a select committee. Not a mere dozen, but over 160 House Republicans have co-sponsored the resolution demanding a heightened investigation. Boehner, however, has refused to bring it to a vote. How can we hold Obama accountable when those who are supposed to be leading our own party are willing to look the other way? The Egyptian people are showing us a lesson—it’s time to clean house! Previous PostNBC: Businesses, Unions and Schools all Warn of Cuts in Hours Due to ObamaCareNext PostIs a Life Tenure too Long for Supreme Court Justices?